Like a swiss army knife, the 64 LRC is incredibly versatile. She's also the biggest 64' you will ever see. With a near 20' beam, she has wide companionways, an aft deck with huge grill and a cockpit with access to the water, which is ideal for fishing or diving.Her lower helm with Portuguese bridge, has excellent visibility, a large flybridge to run and entertain from, along with room for her 14' Novurania RIB and davit. Designed for the owner operator, she has 5 stations (2 of them are wing stations to aid in docking).Designed by the late Tom Fexas, and built at the Camargue Yacht Yard (known for building over 120 Offshore Yachts), you won't find a better combination of quality, overbuilt construction, fit and finish, and sea handling attributes.If you're in the market for a 64'-70' cockpit motoryacht, this is a must see! United Yacht Sales New Jersey would love to guide you through a personal showing of this 64' Offshore Out Islander 64 Lrc 2009. 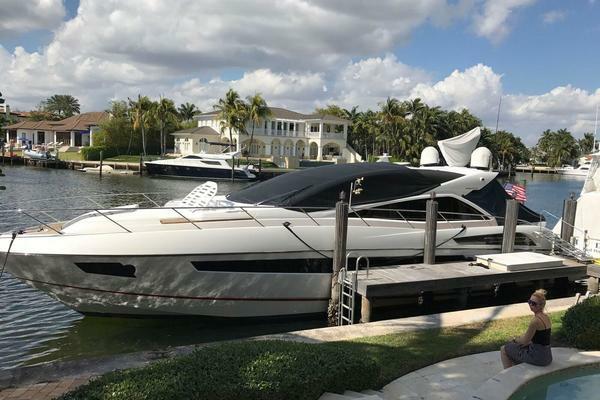 This yacht for sale is located in Stuart, Florida and priced at $1,195,000. For a showing please contact us by filling out the form on this page and we will get back to you shortly! The OUT ISLANDER 64 LRC was one of the last designs by the late Tom Fexas. Taking cues from years of designing the Mikelson Yachts Nomad series of yacht fish and built by the renowned Camargue yacht yard (the builder of Offshore Yachts) in Taiwan. With Camargue's experience of over 120 custom builds, the Out Islander 64 LRC is not only the ultimate cruising machine, but her over built standards and quality fit and finish are second to none.The 64 LRC is a Semi-Displacement hull with generous flair at bow sections, double chines, prop pockets, swim platform, underwater exhaust with FRP exhaust barriers.Hull Construction:Hand laminated FRP utilizing only bi-directional and uni-directional material, vacuum bagged Core Cell solid laminate below the water line with high quality iso and vinylester resins.Full-length hull girders of high density foam cores with bi and uni-directional material.Exterior hull finish in high gloss Cook gel coat, Reichold Hydrex vinylester resin laminate.Multiple thwartship girders reducing panel size and increase impact strength.Cored structural bulkheads padded at hull, bonded as per schedule.Putty coated bilges for smooth finish.All bonding of hull to deck, roofs to cabins done with FRP, exterior finished with gel coat.30 mil epoxy barrier coating and two coats of bottom paint.Sealed bow compartment (crash bulkhead) with water tight hatch.Structural upper and lower FRP rub rails capped with solid stainless steel.Prop Pockets to reduce propeller draft.Port and starboard hull doors for convenient access.Port lights recessed in hull sides for protection.Hull side port lights thru bolted for added safety.Full length keel increasing directional stability and propeller protection.External Parts:Hand laminated FRP construction utilizing Core Cell sandwich vacuum bagging where appropriate of exterior doors, molded in recessed window and door frames and exterior window frames, internal storage cabinet, port and starboard bulwark doors.Stainless steel radar arch.Molded and gel coated finish of interiors of all FRP hatches and doors.FRP Rear fashion plates.Tinted tempered window glass (10mm fwd, side, aft and all doors).Flush FRP recessed access boxes for exterior plumbing and electrical fittings.Exterior materials of gel coated FRP, stainless or optional teak, no exposed aluminum.Superstructure and Deck:Hand laminated FRP utilizing bi-directional and uni-directional material with Core Cell sandwich, high quality ISO resin, vacuum bagging, deck mechanically and FRP bonded to hull.Suitable high compression cores as required for hardware mounting.Exterior finished with high gloss Cook gel coat all surfaces, two tone non skid finish at decks.Main deck soles and engine room bulkheads padded and cored with appropriate sandwich materials.High bulwarks protecting recessed walk-around decks.Leak proof window frames molded into cabin sides.Gel coated joint at overhead deck liner to main cabin sides.Molded in multiple facet and plank lines for detailed appearance and strength.Lead shot for ballast.CoreCell on the interior floor and bulkheads. Northern Lights 20KW diesel generator (1992 hours) and16KW diesel generator (1958 hours), with 12V start, whisper sound shield, exhaust separators and E.A.R. anti vibration mounts. SAE C LIVE PTO hydraulic pumps. Thruster controls are proportional (3) jog lever stations included. Some of her features include shallow draft with protected running gear, 800 gallon per day water maker, two ice machines, two Northern Lights gens, fuel polisher, Furuno 3D electronics, walk in stand up engine room, and a life raft. Five stations with proportional bow and stern thrusters and wide covered walkways make her a dream to dock shorthanded. The cockpit is perfect for fishing and diving and has a huge freezer awaiting your catch. There are three staterooms and two heads. The master which has it's own staircase is midship and has a king bed and walk-in closet. The forward staircase leads to a queen VIP and a guest stateroom with two twins to port. She is the biggest 64 you will ever see.